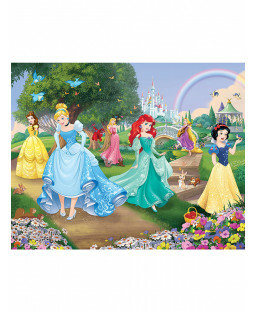 Snow White, Cinderella, Aurora, Belle, Jasmine and Ariel Duvets and Disney Princess Bedding! Create a beautiful Disney kingdom for your little princess with our complete collection of official bedroom accessories, toys and games. Find all your favourite Disney Princesses in a range of single and double duvets, toddler beds, wallpaper and curtains here at PriceRightHome. Bring your child’s favourite Disney Princesses to life with our exciting range of bedroom furniture and accessories. We have Snow White, Cinderella, Aurora, Belle, Jasmine and Ariel, all in a selection of bedding and décor to create the perfect princess inspired room. We also make a 110% price beat promise, so in addition to having an unbeatable variety of princess products, we can’t be beaten on price either. Explore our collection of official Disney products and design the ultimate princess bedroom. We have bedding sets and toddler beds for getting that beauty sleep and LED lights to make a bedroom feel more like a ballroom. We even have a toddler bed in the shape of Cinderella’s carriage. As well as bedroom furniture, we also have a range of Disney princess toys including bikes, tents, and even a karaoke player. And with free UK delivery on all orders you’ll feel like royalty!